Getting engaged is one of the great moments of our lives. We love having the opportunity to play a small part in your big day. This is your opportunity to share your one of a kind moment with others. Email us your proposal stories and we would love to post them. Congratulations on your engagement! We wish you a long and happy life together. We had just left our church after hosting middle school youth group - we were heading back to my house when Mikey got a call that someone had broken something at the church & we needed to head back. We turned around & I said that I was going to wait in the car. I was sitting in the car for a few moments (completely unsuspecting) when Mikey called me & said “I think you should come inside...” At that moment I thought that either something was terribly wrong or this. was. it. I walked inside slowly & turned the corner to see him standing in the dark at the bottom of some stairs with twinkling lights headed up the stairs - he led me up the stairs to a table with a picture on it - he explained that it was a picture of the building where we met 4 years ago, working at Starbucks together. Then we headed to a second table with another picture. Mikey explained that this was a picture of the place where he expressed his feelings for me the very first time, my house. Then we headed to the last table & the last picture. It was a picture of our church & Mikey said “This is a picture of the place where we’re standing, it’s where I found my calling, it’s where I fell in love with you & it’s where I’m going to ask you to marry me...Ashley Finch will you be my wife?” && I said yes! Logan proposed to Isabelle one night when they went out to dinner with a close group of friends. Before Isabelle knew what Logan was doing, he was down on one knee asking to be hers forever. Isabelle and Logan got married on a beautiful October night in the heart of downtown Vancouver. The bridal party also made a special trip into Erik Runyan Jewelers before the wedding. We were so lucky to get the opportunity to celebrate with them! We love how Isabelle describes their love on her wedding website, “As the night came to a close, he walked me outside, gave me a huge hug again and took me to my car like a gentleman. He told me to get home safe, and still does every time I leave him. The Hartley's have been family friends for a couple of years now. Mark proposed to Nicole in May of 2016. Listen up to his planning because it is pretty special. He had a group of Nicole's closet friends get together and pretend like they were going out to do a fun photo shoot with a photographer. They drove out to a beautiful spot overlooking the water where the girls began taking pictures together. All of a sudden Nicole turns around and to her surprise sees Mark walking towards them ready to get down on one knee and ask her to marry him. Nicole and Mark got married almost a year later on April 2, 2017 at Langdon Farms in Oregon. We are so excited for the both of you to start a new journey together. Thank you for allowing Erik Runyan Jewelers to help with your love story. Click on the link below to see more pictures from Mark and Nicole's Wedding Day! November 26, 2016 marks a special day for our friends Cambria and Mack. If you love creative proposals, this one is the story for you. Earlier that week, Mack had been telling Cambria that one of his friends had a plane that he wanted to fly them around in over Vancouver. Cambria agreed to go up in the air and see Vancouver from a different view. Early in the morning on the 26th, Mack got a call from the pilot saying the weather had cleared and they were ready to go up in the plane. Quickly Mack got dressed and went to pick up Cam to go on their adventure. The story goes that they were going to fly over their church's new campus. As they were flying over, Cambria looks down and sees a big tarp with the words spelled out 'Marry Me' in big letters underneath them and Mack pulling out a ring in the plane. Well done, Mack. We can't wait for your wedding this summer! We love the soon to be Krave's here at Erik Runyan Jewelers. If you want to meet a genuine and fun loving couple, these two are right up your alley. Ross has grown up with one of our daughters throughout school and came in to pick out a ring in 2016. Lauren moved to Vancouver from Kansas but soon fell in love with the Pacific Northwest as well as with Ross. They met at the gym when a mutual friend introduced them to each other. They instantly hit it off and soon started dating after. When the time came for Ross to propose he wanted to make it special and a surprise without Lauren finding out what the plan was. The two ended up going on a run together and Ross decided to hid the ring in his sock of all places so that Lauren would not see a ring box outline in his shorts. The two finished their run at the Camas fishing docks where Ross had a photographer waiting out for the perfect moment. 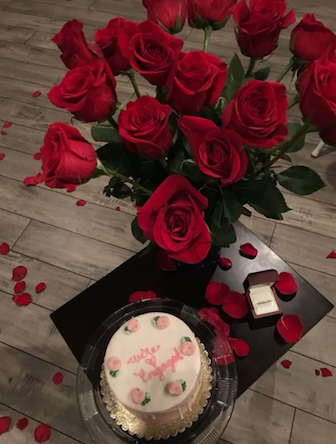 Ross got down on one knee and Lauren said YES! Lauren and Ross have the date set to get married in July! For more pictures, check out the adorable couples engagement shoot up in the perfect scenery of the Gorge. We can't get enough of you two! Our story began in February 2016 at The Patio on Lamont in San Diego, CA. We met for the first time over dinner, a move neither Jack or Erin were typically fond of. Committing to a full dinner for the first blind date usually wasn’t so exiting...what if there wasn’t a spark? You would have to sit across from one another pulling teeth for conversation. To much surprise, the immediate chemistry, amazing conversations and endless laughing left both Erin and Jack wanting to commit to future dates. Jack and Erin both internally knew from the first date this was the person they would marry. Our proposal was magical in that Jack “did it right”. He flew up to Erin’s parents asking for her hand in marriage. Jack picked out a gorgeous pear shaped ring at Erik Runyan Jewelers and excitedly started planning out the entire proposal. In May 2017, Jack with the company of his parents and Erin’s, pulled off a huge surprise proposal at the L'Auberge over looking the beautiful ocean sunset in Del Mar, CA. Erin was speechless, overwhelmed with joy! Our story speaks true to the old adage; when you know, you know. We look forward to all our adventures to come and life chapters to embark upon. Gregg lives in England. His fiance, Kalie, found the ring of her dreams at Erik Runyan Jewelers. Our salesperson, Kelsey, worked with Gregg via E-mail to get Kalie the ring she wanted. Gregg proposed in England. Kalie said, "Yes"! Congratulations to both Kalie and Gregg. We are so excited to could be apart of your love story! We absolutely LOVE Chris and Taylor! Chris came into our store with his mom, future mother in law and Taylor's best friend to pick out the perfect ring for his future Mrs. We are so excited for these two! Check out the recap of the special day that Chris sent us below. "It was the first day of Winter, but I was sweating like the first day in summer. We had planned a night on the town for our One-Year Anniversary. Dinner at Portland City Grill, site seeing, and a proposal. She didn't know about the last bit, which made the moment that much more euphoric. At dinner I did my best to eat as much as my tempestuous stomach would allow. Hoping my lack of appetite wouldn't give away my true motives. We left Bancorp Tower and made our way to Pioneer Courthouse Square where my photographer friends awaited our arrival. Late by 20-30 minutes I was relieved to see them still there. We exchanged gifts, for me a Game of Thrones rendition of Monopoly, and for her a ring. I like to think my gift was better, but in reality I received two gifts that night the second starkly better than the first. First was the game, but the second... the most incredible woman I have ever met." I needed an engagement ring for my wife-to-be and I had never purchased a piece of jewelry in my life. I was sweating bullets because I had once chance to get this right. My fiancé and I were on a tight schedule with only a modest budget, and looking for a rather specific type of band, setting, and gemstone. Alana at Runyan Jewelers looked at photos of samples we liked and pulled together several options that not only met our timeline, budget, and ring preference, but exceeded them. The engagement ring we got was absolutely phenomenal! Stunning, brilliant, and perfect in every way! My fiancé loved it and shows it to everyone with lots of ooohs and ahs from people who see it. Alana, Erik, and the jewelry staff made a special day even better, and I'm breathing a sigh of relief. I can't recommend Erik Runyan Jewelers enough! They were very helpful, friendly, and patient with a newbie like me. It was a rainy day in Berlin. Nate had scrambled to get a ring ready before their three week tour of Germany (thanks, Runyans!) and nervously tucked it away in his luggage. Erica was so delighted to be showing Nate around her fatherland, and had almost successfully put out of her head the sneaking suspicion that a proposal might happen on the trip, a suspicion which had been placed there by the numerous and not-so-subtle predictions of friends (“Ohhhh, you are totally coming back with a ring on it!”). Nate had also armed himself with a plan that would keep Erica from getting tipped off too easily when the big moment arrived: after they shared a rom-com worthy kiss on a bridge over the river Main in Frankfurt, he said, “We should kiss like that again in a romantic spot in each city we visit.” Erica, of course, had cheerfully agreed. Despite the rain and their respective ailments - Erica with a bruised foot and Nate with a cold - they seized the day. Erica remembers feeling a familiar gratitude as they dawned ponchos and rode through the city; this wasn’t the first time she’d caught herself feeling downright happy in spite of circumstances that would otherwise have made her downright cranky. Nate has always had a knack for bringing out her smile. Later that night, they walked/hobbled down the street from their trendy Berlin abode to a sweet and sophisticated neighborhood restaurant, where they conversed at length about the love and gratitude they felt for one another, their relationship, and their families and friends. The love at that little table was as palpable as the food was delicious. After dinner they decided to walk through a little corner park named Kollwitzplatz. The rain had let up but left a sheen on the cobblestones and a freshness to the air. They stopped in the middle of the park for a kiss; thanks to Nate’s clever set-up in Frankfurt, Erica was none-the-wiser when the kiss was followed by heartfelt words of love and commitment and a reach into his jacket pocket. Only when Nate knelt down and held up the ring did she fully realize that yes, that suspected proposal was indeed happening. Then a “YES!”, a few tears, and several more kisses... now they’re engaged! After three years, Justin and I were able to celebrate the end of a long distance relationship by getting our first home together! July 3, 2018 was the day we’re were going to be officially given our keys and able to view the home. Of course we wanted to see it together so that was the plan. Little did I know Justin snuck to the house prior that day to set up a path of roses leading to our living room. This is where he proposed with flowers, pictures of us, wine (of course) and our favorite song in the background. Not only were we celebrating our new home, but our new future as husband and wife! That night we went to a romantic dinner and I was surprised with the most special and wonderful gift!! The Runyan's were so nice and generous when I was desperately looking to have my ring resized! I Definitely wanted someone I could trust with my ring and I couldn’t have picked a better company!! Justin and I will be heading in to get his wedding band soon and of course we are going to the Runyan's.